Today I took part in another of the Crafty Hangouts featuring some of your favorite craft bloggers! This week’s theme is Easter and I made some adorable little Easter baskets! 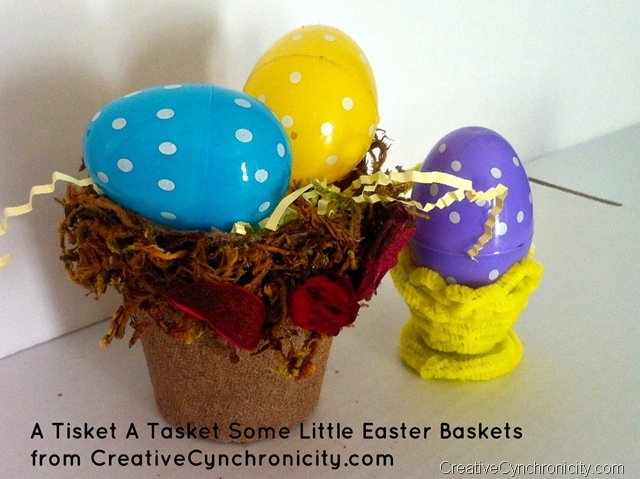 For my show, I presented a couple of cute ideas for making some mini Easter baskets that you can use to hang from an Easter tree, as a table favor/place card holder on your Easter dinner table, as mantel decor, or as small gifts to give out to holiday visitors. Check out my Youtube video below for all the details and click on over to Youtube to subscribe to my channel. I have a lot more crafty videos on the way! Note: As promised in the video, the name of the book from which I adapted the chenille stem basket is Martha Stewart’s Handmade Holiday Crafts: 225 Inspired Projects for Year-Round Celebrations. 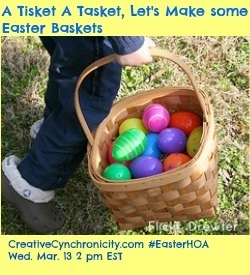 I’ll be a guest on another #EasterHOA Crafty Hangout hosted by Erin of My Very Educated Mother on Friday at 2 pm Eastern. You can watch right from the Crafty Hangouts page. Love them!! Isn’t it amazing how you can create something like this and know it will bring joy to someone!! Great video as well! WOW! You’ve presented this so well! Love the pics and the video! Great job! Thank you! I love the idea of weaving those devil sticks.. I mean pipe cleaners! I’ve got a 2 year old and I am so not ready for the cheapy style of craft supplies. This goes into the idea book!! Thanks Cyn! Those are really cute and most of us have the supplies around! 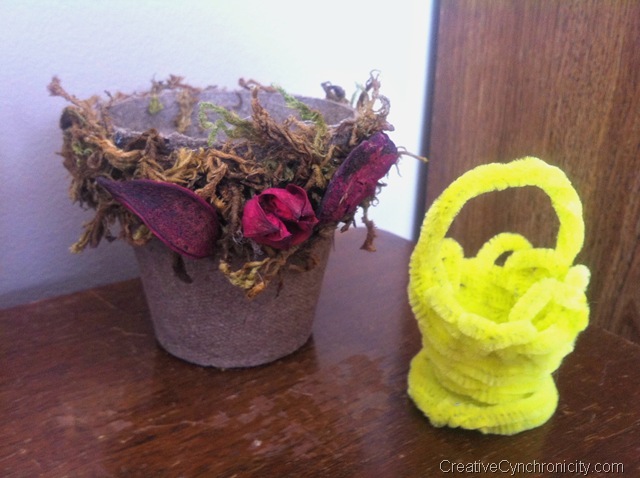 Great video and super fun craft ideas too! My niece is coming over so I think we might try making something together now that she’s a little older. These are soo cool!! I’ll have to try them with my kids! These are so cute! and I agree with Susan on the seedling gift! Cute ideas, especially for last minute crafts. Thanks for sharing! Love these baskets, Cyn. They are so cute and look easy to make also.